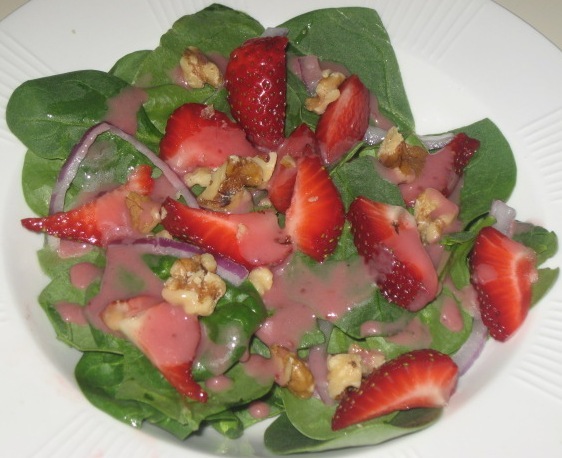 What says spring more than fresh spinach and strawberries? I have a lonely bunch of spinach that popped up volunteer in my garden in late March but my spinach planting is not ready to harvest. The strawberries at the markets are beautiful, so time to celebrate spring with this luscious spring salad. I opted to top the salad with red onion and walnuts today but top with other items to make your salad unique! 1. SALAD: Combine baby spinach and strawberries in a large bowl; toss with 1/2 cup Sesame-Poppy Seed Dressing just before serving. Service with remaining dressing and toppings. 2. DRESSING: Pulse first 5 ingredients in a blender 2 or 3 times or until smooth. With blender running, add oil in a slow, steady stream; process until smooth. Stir in poppy seeds; chill 24 hours.